Despite what you read in some bridal magazines, £1,500 to spend on your gown is a healthy budget and there are plenty of great boho picks out there for you. To help you to get inspired, here are our suggestions for the best boho wedding dresses for less than £1,500. A quirky lace wedding gown by London based wedding dress designer Minna. The gorgeous Tilly dress is made from delicate French lace and has a loose bodice with a fitted silk waistline and a scalloped neckline and comes with a gorgeous silk slip. The maxi length skirt has a lace scalloped train and is shorter and open at the front. Perfect for the bohemian bride who wants to wear something a little out of the ordinary on her big day. Beautiful soft and flowing wedding gown by Canadian wedding dress designer Truvelle. The dress is made from almond chiffon with a sweetheart neckline and low back and a stunning and removable chorded French lace top. Handmade in Vancouver, Canada. This elegant beaded lace wedding dress is made to order by Motil Fine Design on Etsy. It is delicately made from extra fine Solstice French beaded lace in Ivory with soft silky double layered lining small cap sleeves and a beautiful sheer open back and a narrow satin belt. 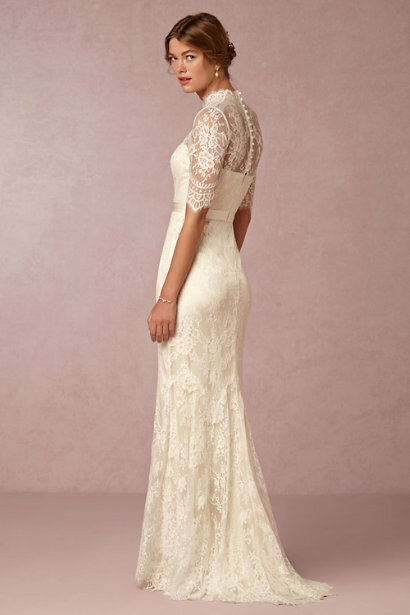 For a bride looking for a vintage boho style gown then this beauty from BHLDN may be right up your street. We’ve completely fallen for this illusion high-neck gown. Set apart by half-sleeves and the most delicate allover lace, a satin ribbon cinches the waist for added definition. We'd add romantic accents like a piecy, loosened chignon and pearl accessories. Another beautiful dress from UK based boho wedding dress designer Minna. The Lavendar dress is made from delicate silk chiffon, fine tulle and embroidered lace. The loose fitting deep V top half perfectly compliments the glitzy, champagne lace skirt. It is glamorous boho at its best. Bang on the money at £1,500 is the Juliette dress by UK bridal designer Phoebe Blockley. The gown is made from a silk skirt and a top layer of delicate, soft silk tulle. It has a beautiful high neck line, long sleeves with plenty of embellishments on the shoulders and falls into a deep V at the centre of the back. This gorgeous gown made from luxurious silk is perfect for bohemian bride who wants a touch of vintage glam.